With colder weather slowly creeping in, I have fully been embracing my less busy schedule with some cozy pamper nights at home. This means candles, hot baths, and face masks! 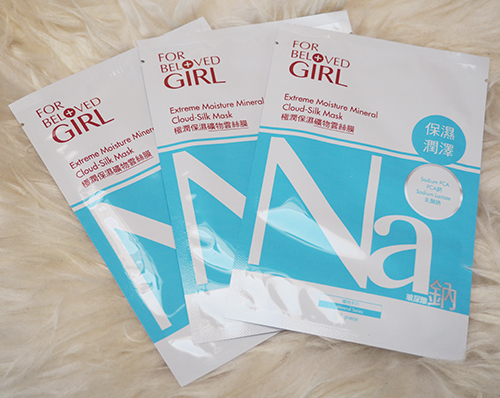 I was recently sent some new masks to try out from For Beloved Girl, a new sister line from Taiwanese cosmeceutical company, For Beloved One. It's aimed at a younger demographic and offers a range of "cloud-silk masks" at a very reasonable price point of $12.99 CAD/pack of 3. So what exactly is this "cloud-silk" technology? Crafted from top-grade cotton and textile technology, cloud-silk is transparent and invisible, with a high degree of elasticity. According to the brand, the ultra-fine cotton fibres in the masks lock in more serum for complete absorption within the skin. This mask is unlike anything I've ever used before. Unlike those thick and opaque white sheet masks most of us are probably used to, the material is super thin and, when pressed down on the skin, essentially see-through. Because of how malleable and soaked in serum the mask is, it is actually bit more difficult to work with since the cloud-silk folds over and sticks to itself but you can easily play around with it to get it into place. For Beloved Girl Cloud-Silk Masks are also packed with minerals such as copper, iron, and zinc to target specific skin concerns. I received the Extreme Moisture Mineral Cloud-Silk Mask made with Hyaluronic Acid (Na) for extremely dry skin and the Skin Renewal Mineral Cloud-Silk Mask made with Calcium Lactate (Ca) to cleanse pores. Each mask apparently contains, on average, the equivalent of 1.88 bottles of mineral spring water spray. Talk about a luxurious treat for the skin! For the Winter months, I know I will be reaching for the Extreme Moisture Mineral Cloud-Silk Mask (above) a ton. There's no heavily perfumed scent and it leaves my skin feeling ultra plump and hydrated. 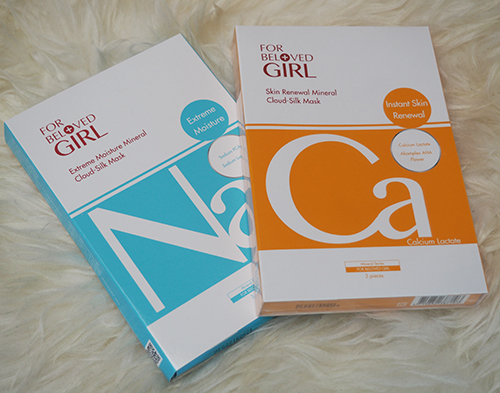 For Beloved Girl offers six different masks to choose from and they can be found in-store at T&T or online at YesStyle.ca.